Martha Kuwee Kumsa is standing in front of her social work students at Wilfrid Laurier University in Waterloo. Out of the corner of one eye, the Ethiopian-born woman catches sight of a man in uniform lingering in the hall. She continues her lecture, but her heart beats faster and her breathing becomes heavier. Then she gets a clear view of the man — and it’s a university security officer, not a soldier come to drag her away. She relaxes. “It’s amazing how the brain works and the body responds,” the soft-spoken Kumsa says of the triggers she has learned to cope with over the years. Martha Kuwee Kumsa of Kitchener is at home in Canada, but still has strong feelings about her native Ethiopia. For years she had long dreadlocks, but two months ago she cut them off in a symbolic gesture. Terror, struggle, pain and grief have all been part of a long journey in which she lost her husband, her home and sense of security. Two months ago, in an act symbolic of those losses, she lifted her dreadlocks and cut them off. Kumsa, 51, who now lives in Kitchener, had let her hair grow since moving to Canada and starting work on her PhD. This spring, however, she decided a woman her age shouldn’t have hair down to her buttocks. Kumsa knows now, however, that there was more to the haircut than that. In Ethiopia, women who cut their hair are often in mourning. Martha Kumsa was born in Dembi Dollo, a small town 800 kilometres southwest of the Ethiopian capital, Addis Ababa, near the border of Sudan. The youngest daughter of a Presbyterian minister, she was named Martha after the Christian nurse who delivered her. The name she holds close to her heart is her middle name, Kuwee, the name of a heroine in Oromo history. But Kumsa wasn’t allowed to go by Kuwee in Ethiopia, where the Oromo people, the largest ethnic group in the country, are still struggling for equality. took to the streets to support his removal from power. One day, helicopters circled above the crowds. Like many of the revolutionaries, Kumsa thought denouncing the emperor meant denouncing the West, that embracing socialism meant land for the poor. The new regime did nationalize private and church-owned property, but then landlords rebelled. In response, the government closed the universities and students were put to work on the land. Around this time, Kumsa trained as a journalist with the Lutheran World Federation in Addis Ababa. She also married Leenco Lata, a chemical engineer. They had their first child in 1975 and they named her Huriya after an Arabic word for liberation and freedom. But the bliss would not last. In 1977, the dictatorship of Col. Mengistu Haile Mariam unleashed what became known as the Red Terror. Anyone suspected of counter-revolutionary acts was deemed an enemy. Tens of thousands of Ethiopians were held, tortured and executed. Kumsa, who by then was pregnant with her third child, remembers passing bodies in the streets. Her husband became a leader of the Oromo Liberation Movement and active in the resistance. Four times in six months, he was kidnapped during the night.The couple’s two-year-old son, Robale, would grab Kumsa’s legs and scream as his father was carted away. “To this day, my son can’t sleep without a light on,” Kumsa says. Martha Kuwee Kumsa and her three children posed for this photo in 1989. The children are (from left): Robale, Huriya and Goli. All three came to Canada with her in 1991. Three times, Lata was brought home after being tortured. The fourth time, he didn’t come back. When her baby was finally born, she named her Goli, the Oromo word for terror. Kumsa searched for Lata for a year. Family members and friends shunned her, afraid they’d be hauled off to jail or death if they spoke to her. She continued her job at an Oromo newspaper, where she wrote a column that encouraged Oromo women to take back their cultural traditions. One day in 1980, Kumsa said goodbye as usual to her son and two daughters and went to work. The children were then ages three, two and one. She would not hold them again for seven years. When Kumsa arrived at work that day, four men in plainclothes met her at the elevator. She recognized them as the same security force members who had recently arrested a colleague and never brought him back. “My heart started racing,” Kumsa says. The men blocked her way and told her they wanted to ask a few questions. One man showed her a badge. The men threw Kumsa into a car and blindfolded her before speeding away. When the blindfold was finally ripped off, she was inside a security forces building and being dragged down a grey corridor and into a crowded room. She was shocked to see people on the floor, bleeding from their mouths. Their faces were disfigured and pus oozed from wounds. The stench was overpowering. “I was thrown into a living hell,” Kumsa says. Soon after, in what became the torture room, she was asked if she was involved in the resistance. She denied it. Blindfolded and with her hands tied, Kumsa was ordered to sit on the floor and wrap her arms around her knees. She was gagged with a blood-soaked sock. Then, with a rope around her body, she was lifted and flipped over so that her bare heels faced the ceiling. Her captors struck her soles with a whip made of a hippopotamus tail. She screamed, but with the gag the sound was more like a whimper. Then a solution was sprayed on her feet. During all the punching, slapping and burning, her tormentors kept asking whether she was part of a political movement. They were trying to break her body and spirit, and eventually they did. It happened the day she was made to watch the torture of a minister, a man who was a friend. Kumsa, then 24, says she was taken to the torture room 10 times in the first year after her arrest. She was then moved to the prison that would be her home for almost nine years. It was her home during the famine of the mid-1980s when one million Ethiopians died. She wasn’t told about the famine, but knew something was wrong because of changes in the food being smuggled into the jail by prisoners’ families and friends. Pasta was soaked in water and ground up to make bread. Kumsa was never charged, never tried, never officially told why she lost her freedom. But she considered herself one of the lucky ones, spared death because she was a journalist. Many of her fellow prisoners vanished, taken away after their names were heard over a loudspeaker. She taught herself French in prison and then taught it to others. With books, she learned Tigrigna, the official language of the prison. She also taught biology, geography and math to prisoners and to the sons and daughters of prison administrators. Meanwhile, her own children were shuffled among family members. When Kumsa found out they were in Addis Ababa, she concocted a plan to see them. With help from Amnesty International and other human rights groups, and from imprisoned relatives of the former emperor, Kumsa was allowed to leave prison for treatment. Guards were then bribed so her children could get into the hospital where the tooth was pulled. Despite her harrowing life as a prisoner, Kumsa says she felt her greatest pain when Goli, the youngest daughter, spat in her face. Goli had only been a year old when her mother was arrested and felt abandoned. “If this is my mother, I don’t want a mother,” the girl said. The reunion lasted only 15 minutes, but soon after the prison began allowing monthly visits to prisoners. Kumsa’s children would wait all day to see their mother, sometimes without ever reaching the front of the line. The postcards brought her joy. One Saturday morning, Kumsa was washing her hair, preparing for a Sunday visit with her children, when she heard her name over the loudspeaker. It was Sept. 10, 1989. She wrapped her hair in a towel and ran. At the front door of the prison, a bus was waiting. Other prisoners started jumping with excitement, but Kumsa was wary. “What if it was execution?” she wondered. She and other political prisoners were driven in the direction of the security forces headquarters, the place where Kumsa had been tortured. For a brief moment, Kumsa thought freedom might be at hand, since being set free meant processing paperwork at headquarters. When the bus drove by the building, a silence fell over the prisoners. The bus came to a stop in front of red stone building surrounded by a tall, iron fence topped with spikes. As the gate opened, Kumsa saw journalists with notepads and cameras. “Are they going to document our execution?” she wondered. Then she saw a general and watched his lips move as she tried to absorb the words she had waited so long to hear. “You are free from this moment on,” the general said. The prisoners stood like statues, so the general repeated his words. Then, as if being jolted from a deep sleep, the crowd rose. Men clapped and the woman ululated in unison. “It’s a moment I will never forget,” Kumsa says. Close to 90 political prisoners and 400 other convicts were released that day. Mixed with Kumsa’s happiness was anger over bring robbed of 10 years, with no explanation, no apology and no help returning to normal life. Kumsa went to the home of a missionary, where she learned that even the most mundane tasks were no longer easy. She was reunited with her children, but there was no word from her husband, who she believed was still alive. And she had no job or money to support a family. Ethiopia’s government, meanwhile, was in disarray and the political climate remained dangerous. Kumsa was approached by radical militants who wanted her to attend training camps. So seven months after her release, Kumsa and her children, helped by PEN and Amnesty, made their escape. They were driven 700 kilometres south toward Kenya and dropped off in woods near the border. For two weeks, the family walked through dense bush, dodging soldiers until they reached safety across the border. 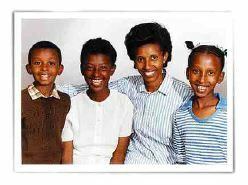 She and the children were in Kenya five months before they were accepted by Canada in September 1991. Meanwhile, the Ethiopia government of Mengistu had crumbled. Several opposition forces had united as the Ethiopian People’s Revolutionary Democratic Front and it had taken over the country in May 1991. Lata was part of a team negotiating the transition to the new government. He called Kumsa from London in July that year to let her know he was alive. Kumsa hadn’t seen him in 13 years. While she was in prison, she learned, Lata had been working for the liberation of the Oromo people, living at different times in Kenya, Somalia and Djibouti. Two days before Kumsa and the children were to leave for Canada, he visited them in Kenya. He had never even see his youngest daughter, now a teenager. Kumsa went to the airport alone to meet him, waiting for two hours until she saw him in the distance, with a cigarette in his hand. She wanted to scold him for abandoning her. Kumsa wished she could return to Ethiopia with Lata to be part of the new leadership in her country. But she and the children came to Canada. One year later, the Ethiopian coalition was falling apart. The Oromo Liberation Front withdrew from the government, disappointed with the delay in bringing democracy to the country. Lata moved to London in 1993, then three years later joined his family in Canada. In Canada, Kumsa reclaimed Kuwee, her Oromo name. For the first year, the family was sponsored by PEN, Amnesty and a Toronto church, but it was not an easy time. But the children were still angry about their childhood without parents and took it out on their mother. With the help of a student loan and two part-time jobs, Kumsa enrolled at York University during her second year in Canada. She got a bachelor’s degree in social work in 1996, the same year that she received a human rights award from the New York-based group, Human Rights Watch. A master’s degree from the University of Toronto came a year later. 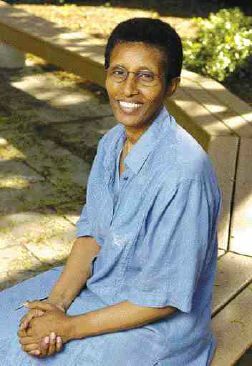 In 2002, Kumsa was hired for a teaching post at Wilfrid Laurier University, but continued to work on her PhD at the University of Toronto and received that in 2004. In Waterloo, Lata worked as a freelance writer, producing two books on the political climate of Ethiopia. But he began to see Canada as a kind of prison. With only a temporary resident permit, he wasn’t allowed to attend school or get a job. Nor could he become a Canadian citizen, Kumsa says, because as a member of the Oromo Liberation Front he had fought to overthrow the Ethiopian government. “It’s a real shame,” says Isobel Harry, executive director of PEN Canada, who has heard Lata speak at conferences and describes him as a scholar. Federal government officials won’t comment on Lata’s case. Kumsa knew that sooner of later her husband would leave Canada. And last August, he moved to Norway, a country he finds more sympathetic to the struggles within Ethiopia. From there he continues to work on the plight of the Oromo people. Kumsa believes that her destiny, too, is wrapped up in Ethiopia. She would love to join her husband, the man she calls her jewel, to fight for recognition of the Oromo people. There have been times since she cut her hair when she has wondered if she is ready to run again. She may even live in Ethiopia someday. But she said she won’t feel safe there until the Oromo people are fully recognized. For now, however, Kumsa is content not to run. Her three children are university-educated and she now enjoys a close relationship with Goli, who will begin practising law this summer. Together, they are working on a research project about Oromo youth and how they identify themselves in Canadian society. Kumsa is also studying Oromo spirituality and ancient birthing rituals. She will present a paper next month at a conference in Nigeria. Most of her research centres on the immigrant’s sense of belonging and identity. “I’ve been running after things and from things,” Kumsa says. Still, the walls of her university office are bare and few photographs adorn her home. “I never feel settled,” she says.